I suspect the immense heat capacity of the oceans is simply dampening the time to equilibrium effects of the 50% increase in CO2 concentration from pre-industrial. Give it a millenium or so. The sudden swings in sea level tend to add doubt about that millennium estimate. How so? Sea level depends mostly on melting of ice on land masses. If the mean temperature of the lower atmosphere goes up by 2 degrees C, how long does it take for the mass of the oceans to rise in temperature by a corresponding amount? The accumulating heat of the earth at present won't be fully reflected in surface temperatures until heat stops going into the oceans and raising their heat content. We know that total heat content of the oceans is increasing, so we know surface temperature increases don't fully reflect the current planetary radiation imbalance. Actual evidence comes before theory. That is how so. Fact is that there have been numbers of large changes in sea level that have happened on time spans more like decades than millennia. We may be talking past each other here. In the face of warming of the planet, there can clearly be rather rapid melting of land-based ice, raising sea levels rather quickly. It does not follow, however, that full themodynamic equilibrium with the mass of water in all the oceans has reached anywhere near equilibrium, even after all ice has been melted. Surface temperatures won't fully reach such equilibrium until after the oceans have warmed. Sea level depends mostly on melting of ice on land masses. Sort of yes and sort of no? Until a few years ago the increase in sea level was more down to thermal expansion of the oceans than land ice mass loss. Now it is more due to loss of land ice - but where does the energy come from to do it. If I have got Abrupt SLR's postings about the Antarctic right, due to bathymetry this is even more true for the Southern Continent. Ice shelves are being melted from underneath, as are glaciers and ice sheets resting on the sea floor at great depth. Even in winter, with land temperatures n degrees below zero, where n is large, ocean currents still bring in warmth at depth to gnaw away at the ice. If / when the Antarctic circumpolar current weakens, this will allow yet more ocean warmth to get down south. It is this that is most likely to cause abrupt sea level rise, and the principal energy source is from the warming oceans. The attached map shows how much of Antarctica is below current sea level. Most / many ? IPCC scenarios envisage going over the +1.5 to +2 limit but then the miraculous (as yet non-existent) low-cost technology will exist to directly capture many billion of tonnes of CO2 from the air which will gradually bring down the temperature increase to "reasonable" levels. Of the four main CMIP5 pathways, only RCP 2.6 directly assumes net negative emissions and a decrease in atmospheric concentration. The others (RCPs 4.5, 6.0, and 8.5) gradually stabilize the concentration but without actual decreases. The main factor in that stabilization is probably ocean uptake -- as anthropogenic emissions are reduced later in this century, at some point the downward flux in the ocean is able to start eating away at the anthro CO2 pulse. Eventually most of it will end up in the ocean, but it takes a looooooong time. This, incidentally, was why a lot of people in the first half of the 20th century assumed that Arrhenius was wrong and AGW would never be a problem -- they assumed ocean uptake would be sufficient to handle anthropogenic emissions. They didn't understand the shallowness of the mixed layer and the low rate of mixing into the deep ocean. Then (a) Keeling showed that actually the CO2 is in fact accumulating in the atmosphere, and (b) a bunch of oceanographers and geochemists (Takahashi et al.) explained why -- the ocean is too slow to absorb emissions at the rate we're generating them now. All the science I can find on 400+ppm CO2 in the atmosphere before present says the global average temp was 4-6c higher than today. I'm not sure where that is coming from. to 3.6°C (medium confidence) higher than for pre-industrial climate. Thanks, Steven. You beat me to it. Not sure what Petteri's source is, but he make it sounds as though it was 3-4C above pre-industrial. The second says that the mid Miocene climatic optimum is probably (sort of) a good comparison to today's rapid Co2 emissions (and levels). "Going further back into the Miocene, tropical sea surface temperatures were as much as 12°C warmer at 12 million years ago, with CO2 levels similar to today, estimated at around 400ppm. Ice was minimal in high northern latitudes and ice was restricted to inland portions of East Antarctica, while the rest of the continent supported temperate forests"
"The MMCO was ushered in by CO2 levels jumping abruptly from around 400ppm to 500ppm, with global temperatures warming by about 4°C and sea levels rising about 40m (130 feet) as the Antarctic ice sheet declined substantially and suddenly. " "Even allowing for that, the fact that models need a sensitivity of 4°C per CO2 doubling to recreate Mid-Miocene warmth suggests that the modern value is more likely towards the upper end of the IPCC range of 1.5-4.5°C than the lower end"
The alternative is that there more involved than a simple temperature-CO2 correlation. There were most likely other factors involved back then. Has the current back-and-forth between periods of rapid ice growth and near standstill always been there (just with more ice), or is it a result of climate change, maybe via weakening the jet stream allowing warmer air to get to the polar region easier? There was a discussion last year about how there are waves of above/below average melt/gain, and I think that has always been so, and probably due to temporary changes in wind, waves and temperatures. But the weather people hypothesise that global warming has weakened the polar jet stream and with big fat lazy Rossby waves weather patterns can stick around a lot longer. Perhaps this is showing up in longer waves of above/below average freeze/melt? added, probably best to load just a couple of those posts, lots of images and animations. Do any of you know how sea level rise will affect marine glaciers? In my head rising seas will affect melting and also make marine glaciers more unstable and speed up the collapse of the glaciers, but there is a big chance that I am wrong. * Marine glaciers (the big ones) can be more than a kilometer deep below the sea surface, and hundreds of meters above the sea surface. So a few meters of sea level rise should not change the picture much. * On the other hand, if the glacier is finely balanced on its grounding line, a few meters of sea level rise could cause its front part to float, causing it to accelerate somewhat. * However, a much stronger effect would be caused by the gravitational pull of the ice sheet. Should Greenland lose half its mass to melting, thereby causing several meters of SLR, the sea surface height around Greenland will lose tens of meters, as the ice sheet exerts a much smaller pull on the water around it. So remaining marine glaciers in Greenland will actually experience the opposite of SLR. * In such a case of only Greenland melting, local SLR around Antarctica will actually be higher than the global average, as Antarctica is on the opoosite side of the globe from Greenland. Could you please post the source material for a possible sea level drop near Greenland? I am struggling with the mass of the ice sheet being enough to create that large of a gravitational pull on the water nearby! When I first read about this phenomenon I was surprised myself at the magnitude. Layman's intuition certainly doesn't work here. It's easy to find sources discussing the gravitational pull of ice sheets, but it took me a while to find a source that actually provides a number. Here's one that mentions a potential 300 ft drop around West Antarctica. And another one explaining that the effect was first discovered in 2009. A new article in the Guardian about the issue and related matters. I have searched the forum using 'cite' and I can't find the answer, so I still have my 'stupid' question: in light of past comments i have read in some threads regarding referencing of material posted on ASIF, how exactly should work and analysis by contributors be cited? Is there a procedure to follow e.g. contact them by private message for permission, etc? How should the citation be made if a poster uses a handle instead of a real name? Should the ASIF be explicitly referenced as the publication location, etc...? Is there a format we could follow that would be acceptable to members here? Apologies if all this is already addressed - and if so, could I ask for a pointer to it please? Thanks. Is there a format we could follow that would be acceptable to members here? Suggestion: ASIF et al and a link. It is A team effort after all. Thanks Tor, for those detailed suggestions. I would think that material posted on the ASIF is intended for public distribution by default, and there is no need to obtain specific permission. However, it is of course proper to credit the ASIF and the poster, by real name or forum name, as available. It would also be proper to send a private message to said poster, letting them know. Twice I've got a PM for this. I've asked for the purpose of the cite and given the permission after checking if the pm understands the context. Then several people have given their permission to spread the graphs they've made, but these permissions are not easily found as they're usually somewhere very deep in the respective threads. As a service for people like you, there could be a thread for these, but no one has seen it necessary. This still won't solve the issue since some do publishable graphs and speculative graphs and they may treat these differently with this respect, speculative graphs are not usually allowed to be cited by the scientists contributing, and you should have a damn good reason for spreading these. You might get a permission to do so if you do NoT attribute these to any partucular nick. Thanks Oren and Pmt, for those thoughts. Is this correct ? Is it a vicious cycle ? The SSW events are rather normal with big ones every 2 years. One reason for major stratospheric warmings to occur in the Northern hemisphere is because orography and land-sea temperature contrasts are responsible for the generation of long (wavenumber 1 or 2) Rossby waves in the troposphere. These waves travel upward to the stratosphere and are dissipated there, decelerating the winds and warming the Arctic. The March 2018 paper by Judah Cohen quoted above states that these SSW events are increasing in frequency (and severity?) in the Arctic winter and even into spring as the Arctic warms. It also states that this is associated with severe weather events in the mid-latitudes of the USA and Eurasia. Effects are especially severe in the Eastern USA. In the western USA this effect may be neutral or even opposite. The paper also demonstrates the WACCs hypothesis - Warm Arctic, Cold Continents. (figure attached). The paper is well worth a long read and saving (open access). I just hope that little old England gets enough warmth from the Gulf Stream and a warming North Atlantic to be able to shed crocodile tears as Central Europe and eastern USA gets clobbered. Not that I claim to know anything about SSW but the Italian forecasters seem to think this will be a huge event, as I've posted here. We have one this year and had one last year so that looks like an increase in frequency although our data-set is still on the smallish side. They could increase in severity too since they always happened but many were small. Since the ice is so much weaker or in some places not event present the polar vortex is weaker now and because of the ongoing rise in global temperatures the incoming air will probably be warmer too. On a slightly different note....they do bring cold weather to Europe but todays cold winter weather is a joke. During last years cold weather i heard so many complains but it was not that cold or long compared to the winters of my childhood (nor was the wind as nasty, the winter easterlies used to really bite) but they were before 1986.
looking at the polar cell it might look like a new pattern is emerging with 2 rotations about the cold poles, one loosely over Siberia and the other a little more tightly located over the Canadian Archipelago. does this look normal to anyone? I'm not a scientist but that's not a stable pattern. Is it? I do wonder the same! This is not a classic polar vortex split but the Siberian and Canadian polar lows in the troposphere are well separated with strong high latitude blocking separating them. Usually a good pattern for winter weather in the East. That's helpful Sark, thank you! 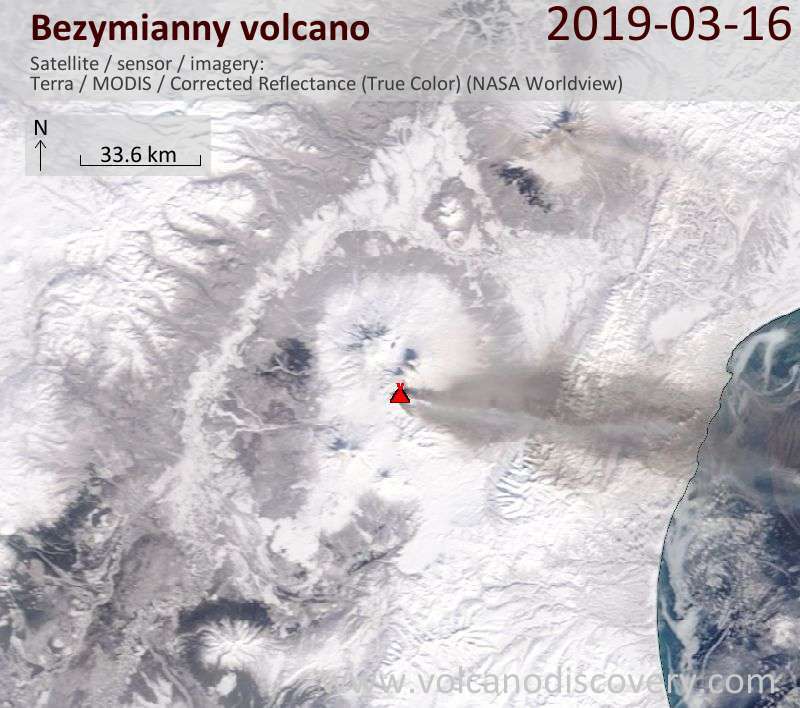 Does anyone know what the source of the smoke on the Kamchatka peninsula was on March 15th and 16th? Was it a volcano? It does not appear to be man made. There is soot on the snow in a nearby location on the 14th, then smoke plumes on the 15th and 16th, then soot on the snow where the smoke plumes were on the 17th. March 17th, 2019: (note: I had to put the images in different posts because they were too big to go all at the same time. I tried and it did not work. Also, the peninsula is flipped because I can't get any arctic view images for the 14th and 15th and had to use geographic view). That seems to answer my question. Thanks. I have not seen anything saying that it has been active in the last few days, but that must be what it was. Thanks again. If my eyes don't deceive me, there is also a plume rising from the mountain just to the north in that last image. That would be Shiveluch volcano, about 100 km NNE from Bezymianny. Shiveluch belongs to the Kliuchevskaya volcano group. 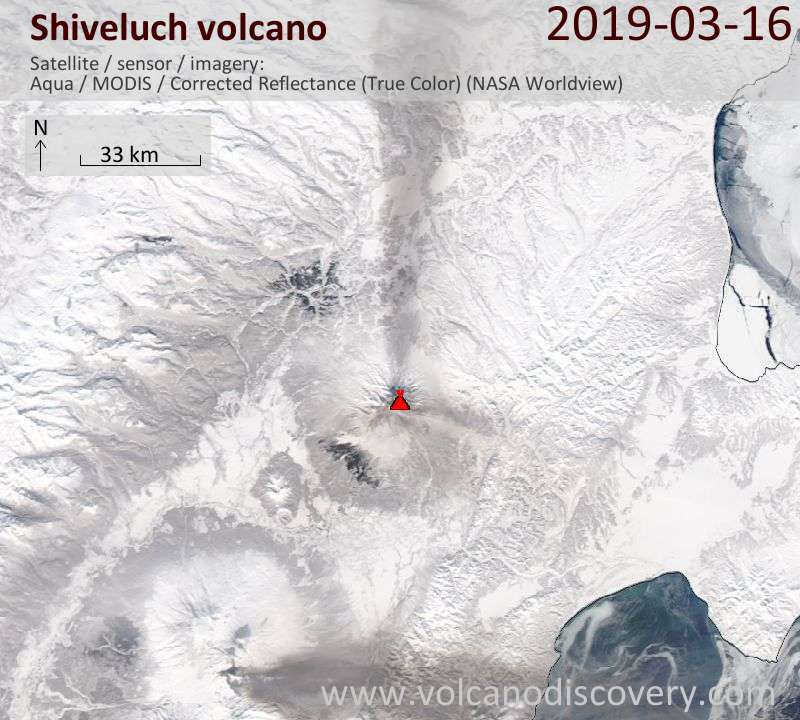 Shiveluch (Russian: Шивелуч) is the northernmost active volcano in Kamchatka Krai, Russia. It and Karymsky are Kamchatka's largest, and most active and most continuous erupting volcanoes. Bezymianny volcano is on the lower edge. The image from 2019-3-16 is a little confusing. Those 2 volcanoes (Bezymianny and Shiveluch) along with Karymsky volcano, are currently erupting on Kamchatka. What's going on with the jet stream here?